You’ve been asking for this tour for years and we’re thrilled to be presenting it to you now. 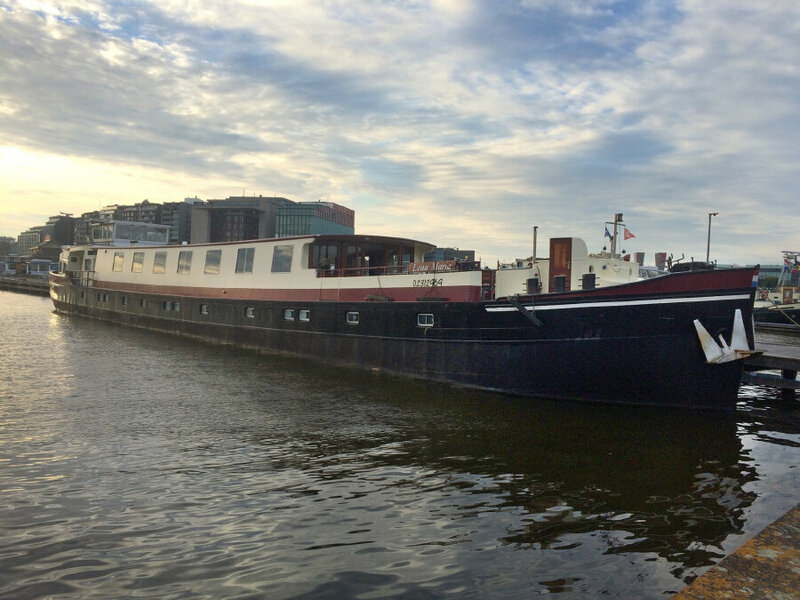 This bike and barge trip takes place in the land where the concept was first developed. Come explore the country where children learn to ride a bike in second grade, where there are more bikes than people, and where bicycles rule the road. 7 nights lodging, 7 breakfasts, 6 sack lunches, 7 dinners, rental bicycle and insurance, Royal Delft factory tour, Rotterdam ferry, guided walking tours of Amsterdam and Delft, and trained bilingual guides. 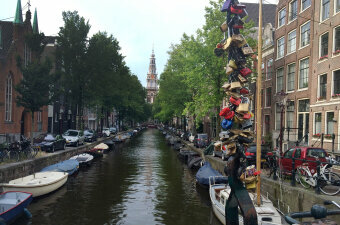 Fly in and out of Amsterdam, Netherlands and take a 15-minute train ride into the center city. Then walk or take a taxi to our barge. 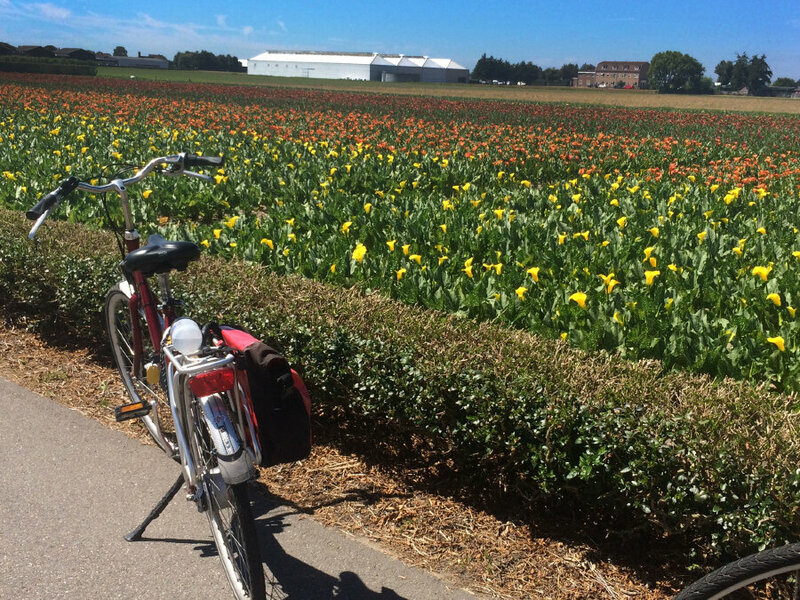 "Seeing the countryside by bike was the best way we could have traveled. I especially loved the small towns and biking through fields of flowers and next to windmills. 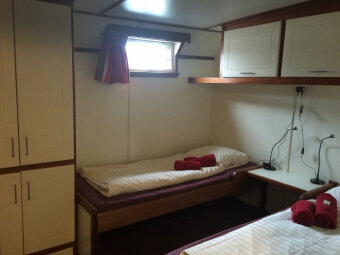 The barge was comfortable and fun to stay on. Outstanding meals- better than any restaurant!" 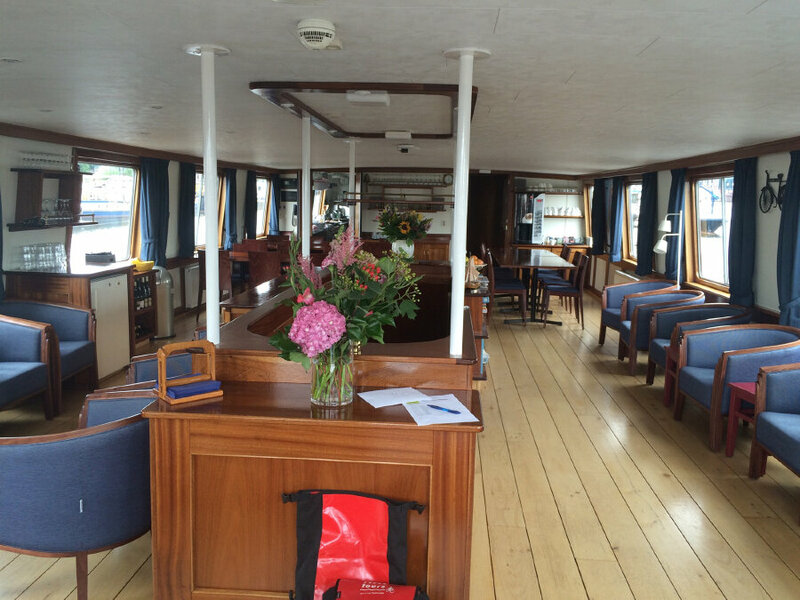 DAY 1: We meet at 6:00pm onboard our boat, the Lena Maria, docked in the beautiful city of Amsterdam. If you arrive early, take time to visit the Anne Frank House or the Van Gogh museum. Our home away from home holds 24 guests. Each room has two beds and its own bathroom. 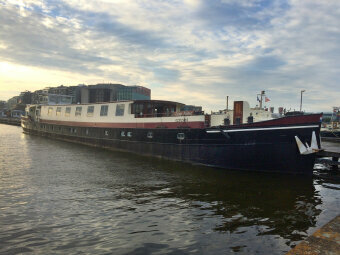 After introductions to the crew, a bike fitting and an orientation, we’ll enjoy our first dinner together on the barge. 0 miles. 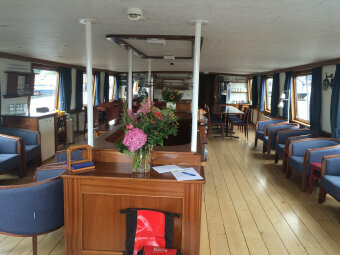 DAY 2: We’ll have breakfast on the boat as we motor to the town of Zaandam. 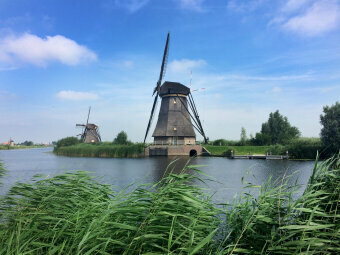 There, we’ll visit the open air museum of Zaanse Schans to watch wooden clogs being made, taste such Dutch cheeses as Edam and Gouda, and learn how windmills have been replaced by turbines to pump the water and reclaim the land from the sea. In the afternoon, we’ll begin cycling through the flat lands to Haarlem. Originally dating from the 1200s, the city is now the capital of the North Holland provice and the center of the tulip industry. 18 miles. DAY 3: After breakfast, we’ll get on our bicycles for a ride full of contrasts. We head out of town on a series of bike paths and quickly begin cycling through sand dunes. When we reach the beach, we turn left and ride along the North Sea. England is just 40 miles across the channel. Then we head inland again and find ourselves cutting through flower fields. With any luck, some of them will be aglow with bright blooms. We’ll end the trip in the city of Leiden, said to be home to the second oldest university in the world. Albert Einstein taught here. Rembrandt was born here. And the Pilgrims lived here for 11 years before heading to North America. If you get a chance, wander some of the street-lined canals to see how many of the poems painted on the walls you recognize. 27 miles. DAY 4: Today’s ride takes us to The Hague, seat of the Dutch parliament and the International Court of Justice. Established by the United Nations, the Court settles disputes between nations. We’ll stop in town where you can choose to wander the shops or to visit the Mauritshuis Museum, home to the famous Vermeer painting “Girl with the Pearl Earring.” We’ll end our ride in Delft, a city famous for its beautiful blue and white pottery. 29 miles. DAY 5: We’ll start the day with a tour of Royal Delft, the last remaining Delftware factory from the 17th century. We’ll learn how the 12 resident painters still hand paint every piece of pottery out of a blue glaze made from a secret cobalt formula. Then we’ll get on our bicycles to cycle atop a dike beside a canal. We’ll see pastures dotted with cows, fields filled with potatoes and corn, and the canal lined with herons, cranes and magpies. It will look like a scene out of a storybook. We’ll meet up with our barge docked below skyscrapers in the modern city of Rotterdam. The city was burned to the ground during World War II and reconstructed with buildings designed by world-famous architects. It is the second largest port in the world (after Hong Kong) and completely different from everything else we will have seen in Holland. 21 miles. DAY 6: We start our day riding on a ferry up the Rhine River to Kinderdijk. Its row of 19 wooden windmills are a UNESCO World Heritage Site. They used to prevent the surrounding land from flooding and some of them are still inhabited. 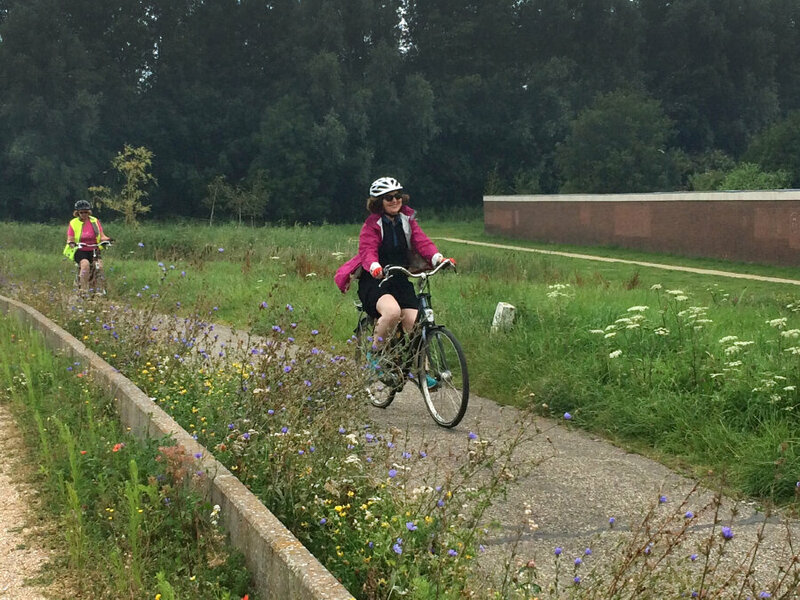 We’ll continue our cycling past gorgeous horse farms and family gardens until we reach the Lek River. A ferry will take us across the river where our barge awaits us. 27 miles. DAY 7: Our last bike ride will take us along the Vecht and Amstel Rivers. We’ll ride past beautiful mansions originally constructed during the 17th century by wealthy merchant families from Amsterdam. We’ll end our last ride back in the capital city. We’ll celebrate our tour at our last dinner together on the barge. Be sure to save some energy to experience the lively Amsterdam nightlife tonight! 26 miles. DAY 8: We’ll say our good-byes after breakfast. We’ll help direct you to the train station or airport for your trip home or onward in Europe. Tot ziens! 0 miles.